Hey there! Thanks for dropping by Ssenir's LOTRO Library! Take a look around and grab the RSS feed to stay updated. See you around! I figured it was time to introduce you to another one of my characters! 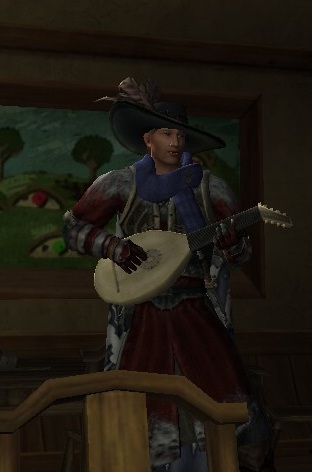 This time, we will meet Aerfin, my minstrel and go-to role-playing character. Aerfin, Singer of Songs, Teller of Tales, Weaver of Words… He is a man of many titles. A minstrel, hailing from the distant lands of Rohan, he has travelled the world in search of inspiration. Although he possesses some musical talent, he is far more renowned for his storytelling, and for his clever style of writing. He toys with words, and weaves them, as a potter may mold clay. He is highly intelligent, and his command of language is quite good. He is known to have moments of unparalleled genius. Although he is a gifted writer and thinker, it is perhaps because he is ever-so-slightly touched in the head. Insane. Batty. In a different realm of thinking… take your pick. He considers himself a “half-pacifist”, that is to say, he spends at least half of his time doing something other than fighting (usually having a drink in the local tavern, where he may provide some entertainment). He is known to randomly break into song, or rhyme, or verse, whenever inspiration strikes him. When asked what he is doing, he will often state that he is doing something entirely different from what he is actually doing, and that if you think otherwise, it is because your perception is skewed, and you should perhaps direct your skewed perception elsewhere, and perhaps see a local doctor to get that checked out. Aerfin often speaks before thinking, except for when he thinks before speaking (he has been known, on rare occasion, to ponder his words for days at a time). He is fascinated by things that to most people seem inconsequential: a flower picked from the south Bree-fields, a trinket retrieved from the Barrow-downs, an empty mug at the tavern. When Aerfin looks at objects such as these, he imagines an entire story; where they’ve been, and what they’ve witnessed. He believes in neither strength, nor flaws, but rather, does whatever seems like the best option at the time. Aerfin stands at approximately 5’10”, and weighs about 150 pounds. He has blonde hair, and blue eyes. He often says his song level is 70 birds (whatever that means). He has an older brother named Diende, who is altogether much more gruff in demeanor than Aerfin is. Perhaps it is because Aerfin calls him “Old-timer”, or perhaps it is because Diende has a slightly more realistic view on life, whereas Aerfin is content to simply sing and write as the world around him crumbles (at least supposedly, that stuff is all personal perception anyway). Tom was altogether impressed by Aerfin’s quick thinking, and decided to let him keep the old boot, about which Aerfin crafted the famous “Tale of Tom’s Boot”, which was widely and highly critically acclaimed (I think). Aerfin is an altogether uninteresting person, once you move past his relatively low level of insanity. In fact, sometimes it is difficult to determine whether he is insane, or rather just flippant, quick-witted, and difficult to interpret. He also has a tendency to make up words, when he is unable to find one that suits his purpose. He was in a tavern, enjoying a wonderfully flavorful and crisp pint of ale, when he was approached by the proprietor of the establishment, and asked to perform. The proprietor, at this point, understandably gave up. He spends his spare time writing, and pouring over the texts of the ancients, looking for subject material for his many short stories and scripts. Concerning his personality, he is easygoing, although he does have a small twinge of arrogancy. He rarely overthinks things, in fact, the only time he thinks is when is thinking, and by thinking you could be far more descriptive by saying meditating. He has a rather devilish sense of humour, and often causes laughs at the expense of others. A faint smirkish smile dances across his lips, and he enjoys a good prank more than most. I don’t worry about Aerfin’s level or gear very much. Mostly I play him when I want to RP, although eventually I would like him to be high enough level to be a main healer. Because I don’t focus on leveling, I use whatever traits are available to me. I do have to admit, I’m definitely happy with the changes made to the minstrel class with RoI. I am not yet high enough level to use any legendary traits, although Rally!, Cry of the Wizards, and Call of the North will probably be the traits I will usually keep equipped. « RoI Legendary Edition Giveaway! Level Up… With Festival Quests!